This one really teeters between 4-5 stars, and since half stars are not allowed, I'm going to give it the benefit of the doubt and give it a 5. It really is as good as anything by Nick Hornby. 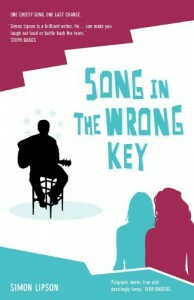 A Song in the Wrong Key is a funny/sad, heartwarming/heartbreaking story about what happens when you suddenly realize that the life you've been quite content with isn't really the life you wanted. Mike Kenton is going through a bit of a rough patch. His 20 year marriage has stagnated and he's just been laid off from a job he lost his passion for years ago while his wife's career is taking off. To help take the edge of the desperation he feels at being unemployed, he turns to music, which had been his passion during college, but which he sensibly gave up when it came time to grow up and lead a productive life. And then suddenly, everything seems to turn in his favor. Does Mike finally get to live his dreams? Will he be able to fix his marriage? Does he even want to? Mr. Lipson does an excellent job of capturing the angst of a socially awkward adult trying desperately not to fall flat on his face as he tries to salvage what's left of his dignity given the situation he finds himself in. Mike's story unfolds as Mr. Lipson masterfully describes Mike's relationships: with his wife, his children, his best friend, and his old college girl friend (not girlfriend), for whom he had unrequited feelings which he never really got over. I can relate to Mike on so many levels and as a result found myself rooting for him as life just sort of happened to him. I also felt the bitter sting of every slight, rejection, insult and outrage, whether real or imagined. This is definitely one writer I will keep an eye on. I find it odd that as an American woman, the contemporary books and characters I most strongly identify with have all been written by British men: Emma from One Day (actually, anything by David Nicholls), Annie from Juliet, Naked (by Nick Hornby), and now Mike Kenton from A Song in the Wrong Key. So on that note, I'll end with an innocent, non-retaliatory, non-judgmental query of Mr. Lipson: Lionel Richie? Seriously?